Home > Branching Out > Question from the Public > What is a tree? My question is: What is a tree in general? I'd like to know the characteristics that define what a tree is. Thank you! If I’m talking about a feathered vertebrate, without teeth, that lays eggs, and can fly (the vast majority of the time), what do you think I’m talking about? It's easy, because birds are a class of animals, the aves, which share these characteristics and are from the same evolutionary path. There are other living things that can fly. But as they come from different evolutionary paths, we do not call them birds. They are, for example, flying insects (invertebrates) or bats (mammals). When talking about trees, we are talking about plants that have developed the same solution to plant competition for access to light: growing tall. And this adaptation, several plants have "reinvented" it. For example, conifers, which are Gymnosperms ("naked" seed plants), and hardwoods, which are Angiosperms (seeds protected in an ovary). From an evolutionary standpoint, hardwoods like maples are more akin to palms, an Angiosperm, than to conifers such as pines. But then, aren’t trees simply tall plants? It depends whom you are asking... According to the classical definition of trees, no. A tree is a plant that reaches a theoretical minimum of 5 or 7m (depending on the definitions) from the ground up, that has a long life expectancy and that has a freestanding trunk made of real ligneous wood. Some foresters add that the plant must have branches at some distance from the ground and bear a single trunk. Some scientists advocate broader definitions of the tree and answer "yes". According to them, the factor that defines trees is simply their size. I will use below as an example of these new definitions that of Francis Hallé a French botanist, specialized in tree architecture and ecology of tropical rainforests. Hallé thought discriminatory the classical definition of trees. He believes that Western scientists created this definition based on arborescent plants they had before their eyes: hardwoods and conifers. Therefore, their definition excludes arborescent plants such as bamboo and palm trees, which are found in the tropics and therefore rather far from the concerns of Western scientists. Why say "a large plant that reaches in theory a certain height"? Because a dwarf tree is a tree anyway. A maple maintained in bonsai form, and a dwarf balsam fir from northern Quebec have one thing in common. They are both very small, but if you planted them in your garden, they could reach tree height. The criteria of height must therefore be judged by the growth potential of the species, not simply by measuring the height of a single individual. Why do some say five meters, others seven, for the minimum height of a tree? I remember some places I visited when I was eight. They seemed immense. When I returned there, as an adult, it looked like they had shrunk... Being "tall", by human standards, is very relative! Why say "up to 5 meters from the ground up?" To exclude plants that have a total length of 5 meters or more, but most of which is buried underground. Imagine two buildings in front of you. The first has 20 floors above ground and one floor underground. The second has a ground-floor, but 20 floors of basement. Which one is taller? The idea of height from the ground up is common to all definitions of the tree: the tree is primarily a plant that grows in height to gain access to light. Why should the trunk be "freestanding"? To exclude vines. Ivy can climb up, but not by its own means. It needs help for support (a tree, a wall). Vines are thus eliminated, under any definition! The adjective "ligneous" means constructed with lignin, a polymer that gives plants rigidity. Think of the bricks in a house. The classic definition then talks about real wood. This is wood of which lignin is produced from the cambium, a layer of cells that surrounds certain plants and is responsible for their growth in girth. Bamboo has lignin in its stem, but it does not thicken over time. So it is not a tree under the classic definition, it is considered a tall grass. Similarly, the Joshua tree is one of the few Monocotyledons to have reinvented secondary growth in its trunk. But as this growth does not occur from a single layer of cambium, Joshua tree is also disqualified. Hallé's definition only cares about the fact that these plants have found a way to grow in height. Good for them, they are trees, and voila! Hardwoods and conifers, yes. If you look carefully at a palm tree, you will notice that its big leaves are directly attached to its trunk. It has no branches. Why do the branches need to be at a certain distance from the ground and does the trunk need to be unique? To differentiate trees from shrubs and bushes. 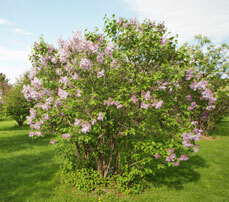 Lilacs have multiple stems that rise from the ground. According to foresters, trees have a single trunk. This addition makes the definition more functional for them. But some plants thwart this rule. A serviceberry tree that grows in an open environment can have multiple trunks, while in a closed environment it will have a single trunk. However, as noted above, one must judge the potential of the species and not that of the individual. Hallé? One trunk, two trunks, ten trunks... "If you hit a plant with your car and you have to walk home, then you struck a tree!" If you want to learn more about this subject, I suggest you try this little game about tree classification, depending on whether they belong to the classical definition, Hallé's definition, both definitions, or none. This will enable you to verify your understanding of these two definitions.